Get ready coffeepeople; there’s a new tree in town, and it is dressed for success. 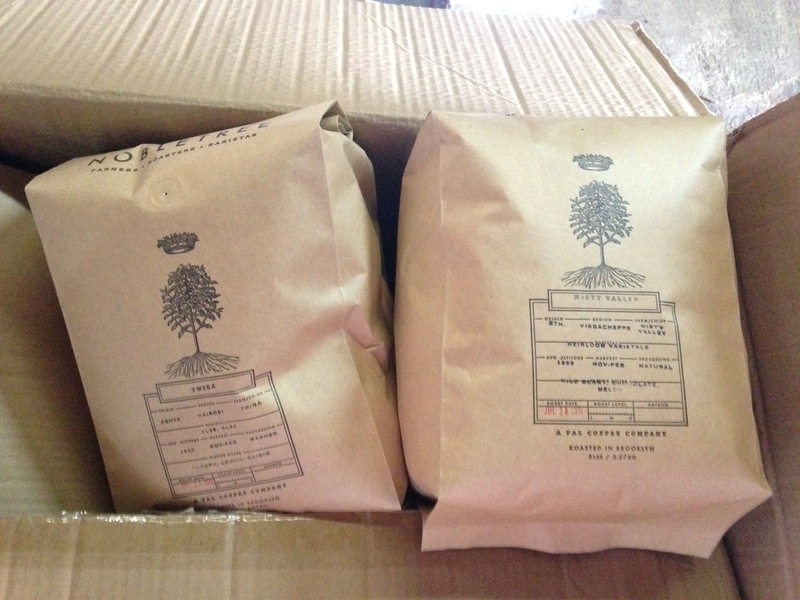 The coffee industry has gone through many identity crises as different roasters, brands, and shops dub themselves “specialty,” “third wave,” “artisan,” and “craft.” Nobletree Coffee need not subscribe to any wriggling category because it effortlessly demonstrates that it is something else entirely: coffee with class. Last night Nobletree Coffee, part of the FAL Coffee family, launched its brand at Red Hook’s Pulley Collective, where it has been quietly gearing up to become the city’s only fully vertically integrated coffee enterprise, a streamlined channel from Brazilian soil to Brooklyn demitasse. “Vertical integration” sounds like a nice, neat Econ 101 textbook term, but if you know anything about coffee you know there’s a very good reason why hardly anyone attempts it: it is nearly impossible and infuriatingly messy. So why has Nobletree taken on a task even commodity giants are reluctant to assume? Because they are the fearless Ironmen of the coffee world; they embrace the chance to swim, bike, and run all those miles to the finish line of truly miraculous coffee. 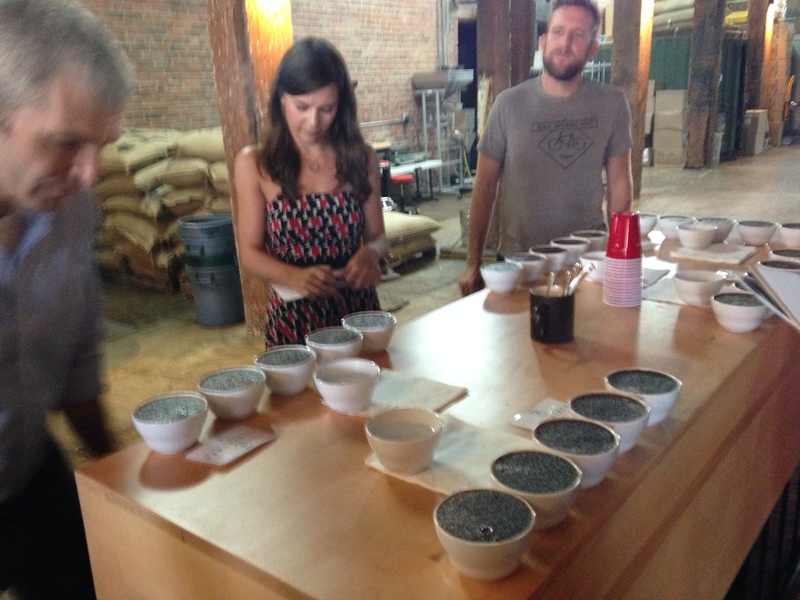 Nobletree Partner John Moore emphasized “the coffee miracle” repeatedly as he walked last night’s small group of foodie/bevvie New Yorkers through coffee “Crop to Cup 101.” Nobletree owns farms in the Minas Gerais state of Brazil, where they sample roasted seedstock to select specific cultivars based on distinct desired flavor propositions. They have 240,000 Yellow Bourbon trees planted, between their Santa Izabel and Monte Verde properties, recently adding another 200,000 to Santa Izabel. Between the two farms they boast 7 different conventionally grown cultivars plus two cultivated organically, including the new Catiguá MG2, developed specifically to be plague resistant and thus suited for organic farming, an additional Noble endeavor. 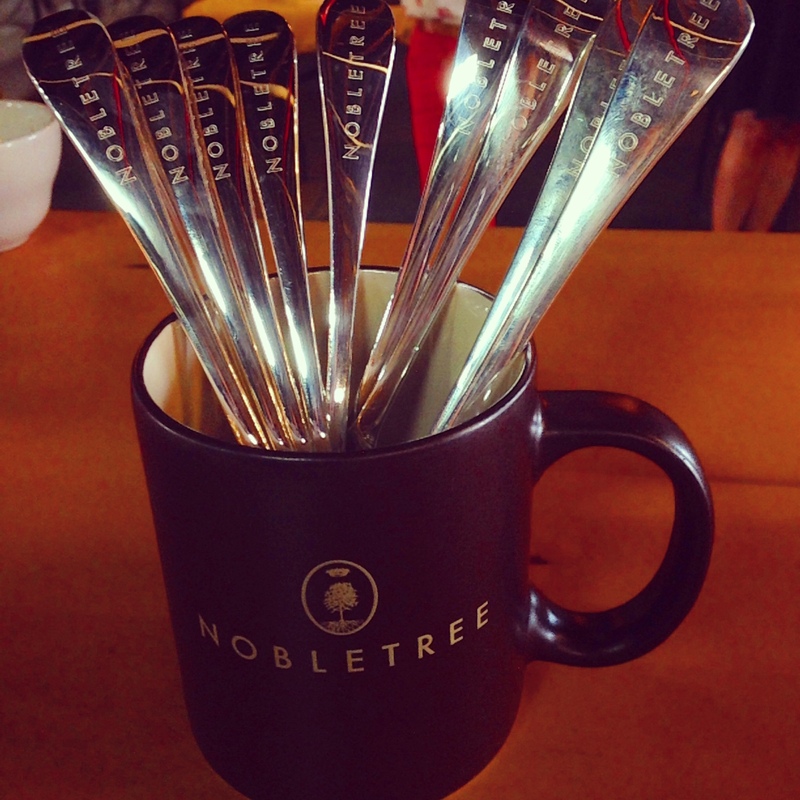 If Nobletree were just a farm, they would already be noteworthy for doing everything against the Brazilian grain. In the land of tree-dried Naturals they embracing the processing spectrum and offering coffees all ways: fully washed, mechanically dried, patio dried, traditional tree-tried, and pulped naturals. In the nation of mechanized harvesting they are creating incentives to attract the labor force necessary to pick every cherry by hand. When you enter the Ironman coffee triathlon of carrying yourself from farm all the way to Manhattan cafe, you care about these details at origin because you know exactly how they will affect you farther down the line. Vertical integration means you can’t pawn mistakes or apathy off on the next link in the chain; you have to pace yourself and know that they way you swim will influence how you bike and how you bike impacts how you run. When you take on the triathlon of coffee integration you have to have a truly panoramic understanding of the connections between stages. And you certainly don’t plan on finishing second. Although we couldn’t all teleport to Minas last night, we did smell a bagful of green Santa Izabel beans and then witness Roastmaster Eric Taylor transform a few pounds on Pulley’s Loring. Over the hum of tumbling beans-in-drum, Moore beamed and shouted, “It’s amazing how much of a miracle it is when you get that cup! So many steps have to be executed flawlessly for coffee to truly become extraordinary.” Moore reminded us that you can’t make anything great happen in the roaster if that greatness isn’t already present in the bean. 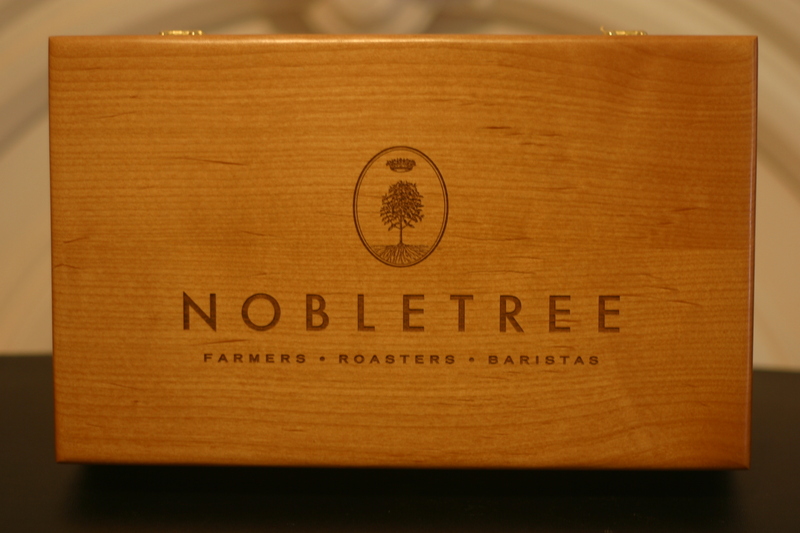 Here he reiterated Nobletree’s tagline, “Truth of Nature Delivered,” and explained the roaster’s role in unlocking what you hope nature (soil, weather, tree genetics) has already given as a result of all your tinkering, planning, and prayers. Nobletree will soon move to their own roasting space in Red Hook, just across the bay from Pulley (as the seagull flies), where Taylor is itching to fire up two Probats and start hosting cuppings, barista trainings, and maybe even some Q courses. To have class you must exhibit refined expertise. As savvy and dedicated Ironmen, the Nobletree team is approaching the formidable task of managing a vertically integrated coffee company with the appropriate amount of training; they have done their homework. Not only does their dream team include Q grader and former competitive barista Byron Holcomb as farm operations manager and Dr. Flavio Borem as cultivar consultant, green buyer Matt Swenson just completed Joseph Rivera’s Coffee Science Certificate course, where he spent two days identifying compounds and charting the developments of acids and other chemical reactions in green-to-roasted coffee. Class is confidence without arrogance, and it is easy to be confident when you know that you have assembled a team where every member knows how to execute his or her role based on depth of experientially-gleaned knowledge. 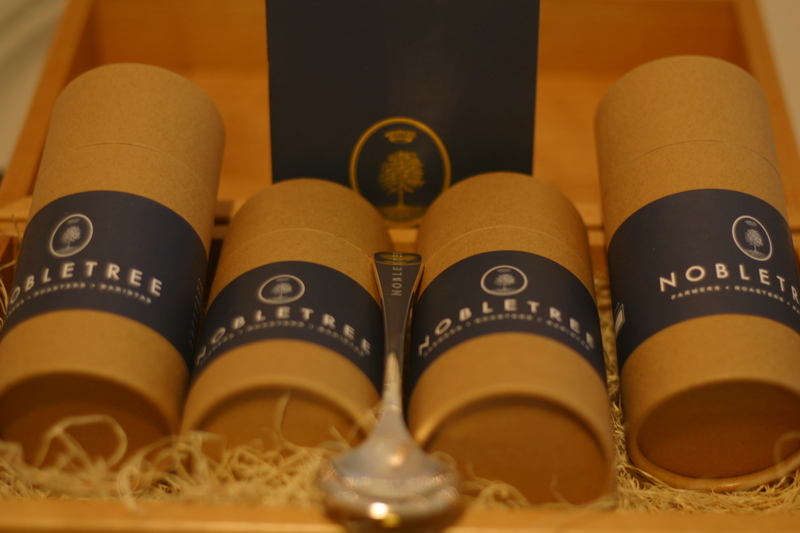 Class is passion without preaching, and Nobletree (the roaster’s) coffee portfolio includes coffee from Kenyan and Panamanian farms doing things their way, just as Nobletree (the farmers) are selling green coffee to international roasters who will do with it as they see fit. and a swag bag that is actually a treasure chest of international flavor. 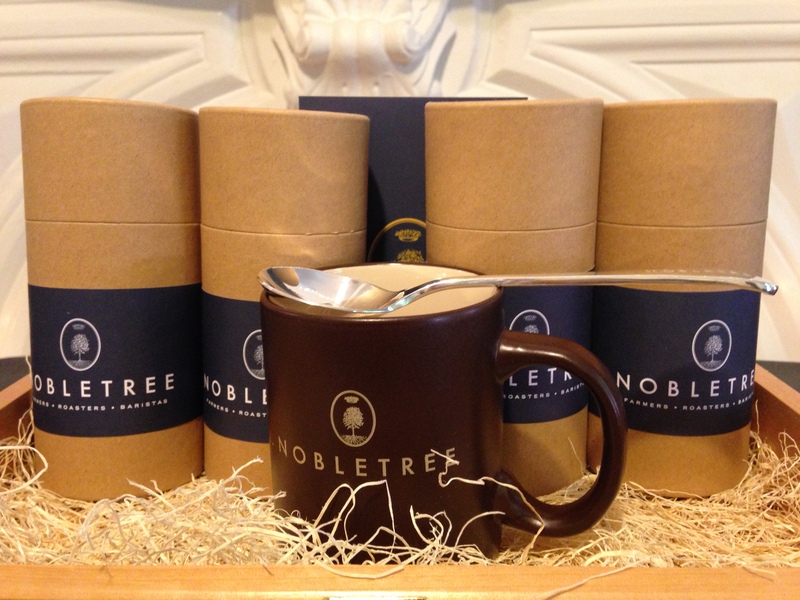 Nobletree is not pretending that the Ironman coffee triathlon—vertically integrating the world’s trickiest crop all the way from the tropics through to a Wall St café that will open next year—is a cakewalk, and the fact that they humbly express an understanding that what they are doing is indeed a monumental undertaking is a major reason why they have my respect. 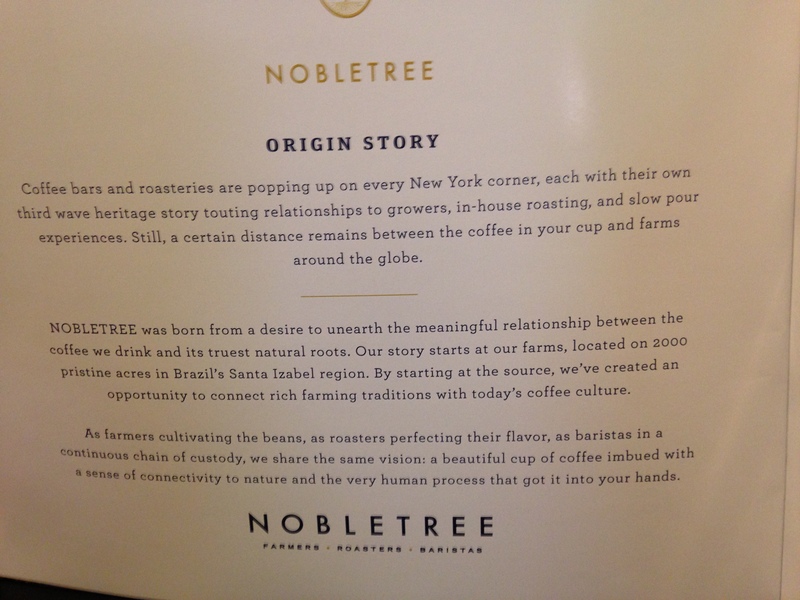 Nobletree calls themselves “Farmers. Roasters. Baristas.” and for me it’s exciting to have conversations about seedlings, Maillard reactions, and Chemex cold brewing all in the same evening with the same team of people. 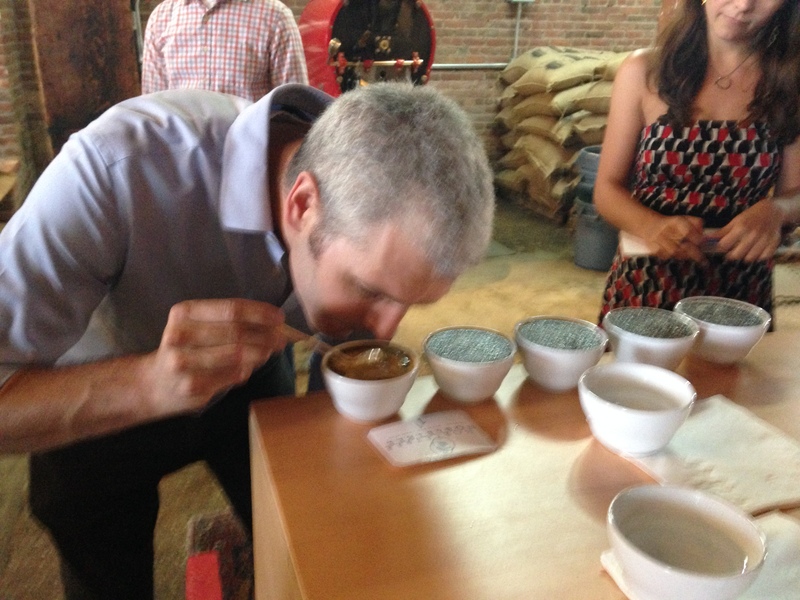 I am completely self-taught in everything I know about coffee, from hybrid varietals through attempting to cup. Even though I’m still an industry newbie, I am too often frustrated by speaking with people who regurgitate the same stock phrases and don’t actually know what they are talking about. 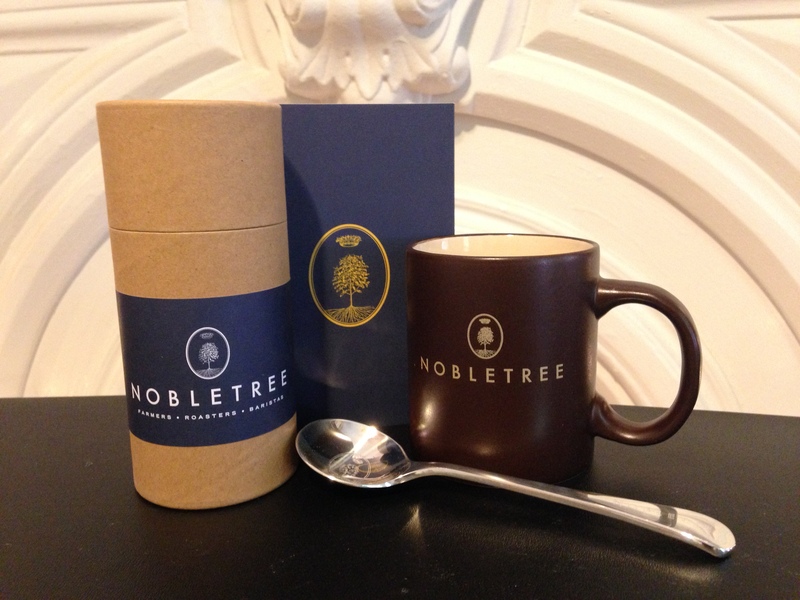 Not only does Nobletree know what they’re talking about, they starting doing it before they started talking about it. In the neverending coffee race, that makes them the triathlete to watch. 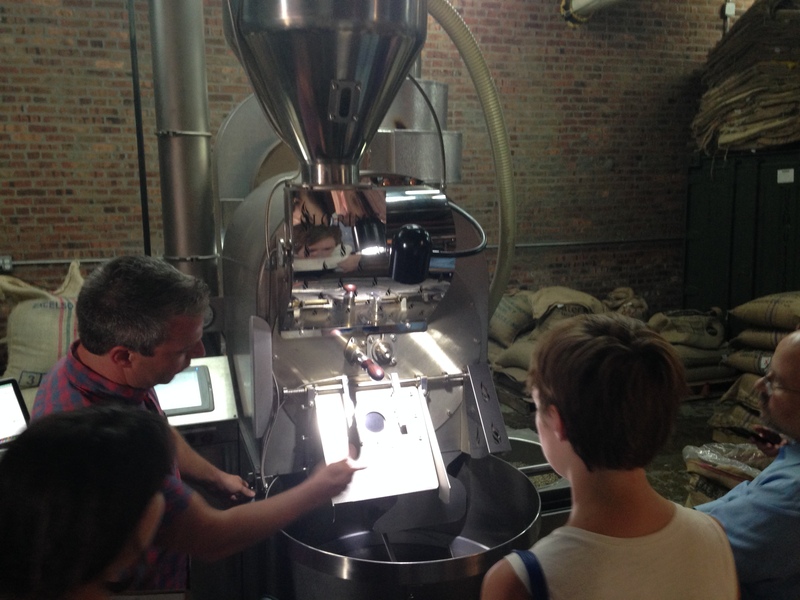 Pingback: Summer 2014 Coffee Crawl | W h e n . C o f f e e . S p e a k s .